Standing on the Ophel at Mount Moriah's Temple Mount looking south, the Kidron Valley falls east toward Silwan. Increasingly visible is the new excavation area above the Spring House at the City of David. Most of the green grassy area shown in the picture below hides the archaeology beneath the surface. The landfill is a product of thousands of years of garbage dumping firstly by residents of the original City of David, and later by Israel’s deniers. The Excavation area (in the center) is the progressive work over the past five years to remove tens of thousands of cubic feet of dust, dirt and garbage to reveal the bedrock and provide public access to the archaeological features a few meters below. 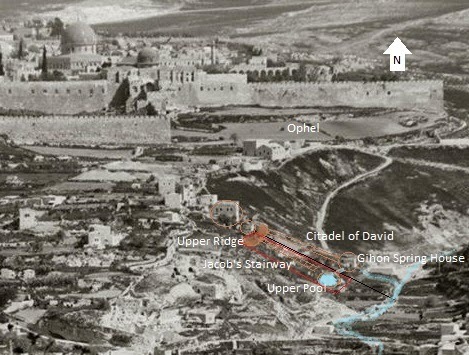 From the south side looking North to the Ophel and Temple Mount, the highlighted excavations on Mount Moriah's eastern slopes are actually located on its bedrock. The Citadel of Daivd (walls) discovered by archaeologists Eli Shukron and Ronny Reich appear to be a later Bronze Age construction north of Jacob's Stairway which runs from the Upper Pool to the Upper Ridge. Many attempts have been made to artistically render the City of David and The Spring House over the Gihon Spring. As more features are discovered the renditions become more accurate. This recently snapped image (below) captures the present excavation on the underground climb from the Upper Gihon Pool to the Upper Ridge, which is where the group are posing. The visible sandbags follow the contour of the bedrock as it falls to the valley floor. On the right (north) of the sandbags are a series of well placed significant boulders, remnants of the southern wall stairway (not connected to the Spring House of Citadel of David). When this wall was first built The Spring House was not yet in existence. The steps and walls of Jacob's Stairway terminate as it meets the foot of the Upper Ridge. This is an important distinction that suggest the wall may have been designed to emphasize the Upper Ridge. The Upper Ridge was recently the highlight of a worldwide guessing contest to discover the meaning or purpose of strange markings carved into its bedrock. This section of the floor is located to the left (south) of Jacob's Stairway and can be seen in the following image with archaeologist Eli Shukron. To the north (right) adjacent to the room with V markings (see the steel cabinet in the far right of the above image) is arguably the most well preserved in-situ artifact at the City of David and in Israel. Every time I see it I shudder when considering its importance, I believe it is and will be determined to be the monument (matzevah - Genesis 28:22) that Jacob erected to confirm his covenant with God and take his name Israel. Further along in the next room to the north is a very interesting configuration that includes a slightly raised platform and a channel chiseled in the bedrock for liquid (most likely blood) to run from sacrifices offered at the back of the room to its front. Adjacent and further north is a room that appears to have operated as a small animal holding pen. In addition an oil press, a grain press and numerous other elements make this Upper Ridge at the Gihon an area that was certainly used for large scale sacrificial use. The floor plan of the entire upper ridge illustrated below identifies each of these rooms. 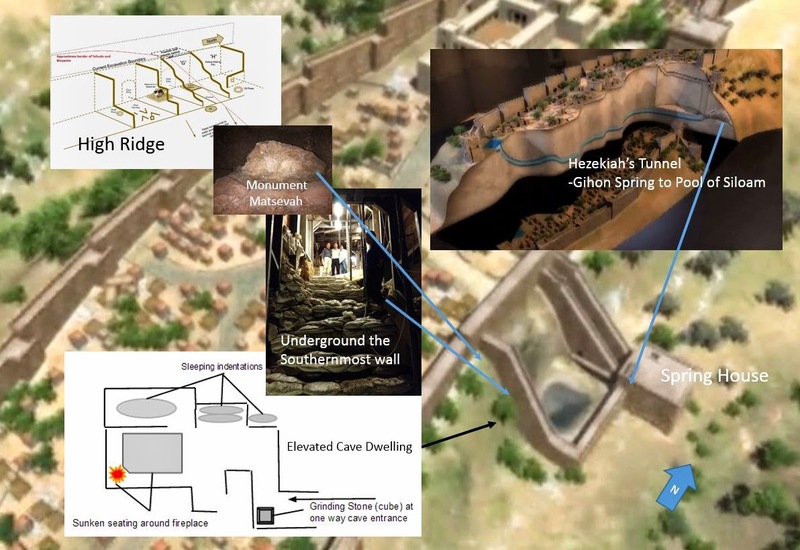 Increasingly possible is the prospect that the Ark of the Covenant may have rested in a tent behind (west) these rooms in the 37 years before it was located in the temple. From left to right - the room with marking, the room with matzevah, the room with blood channel and the room with holding pen. More on this Upper Ridge at the Gihon can be discovered at this link - Hypothesis for Upper Ridge. In archaeological terms this area and other rooms discovered at the Upper Gihon Pool confirm it to be an active early Bronze age II site. For the uninitiated this is arguably the most exciting news because its continuous use from this era confirms that Noah's son Shem, Malchitzedek may have used it as his base for worship at Salem where it is said he presided. This timeline would confirm the Biblical view that Salem is the origin of Jerusalem and the continuous site of Abraham, Isaac, Jacob and David. Finally I am beginning to conceive the original structure integrated into the natural mountain face may have once been a Ziggurat (a Stariway) rather than a wall. If the matzevah at the Upper Ridge is indeed Jacob's then this 'stairway to heaven' would be consistent with his dream. It can be envisaged looking to the sandbags (in the previous image) on the climb from the Upper Gihon Pool to the Upper Ridge. Of all the evil characters that span the pages of Tanach, the 24 books of the Bible, why would Rambam choose Yerovam as the person to juxtapose Moshe? 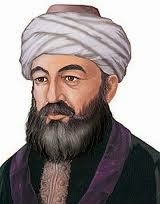 Rambam is one of the most knowledgeable Jewish scholars ever to have lived, so his choice of Yerovam deserves investigation. Most people know who Moshe (Moses) was, that he was chosen by God and led the enslaved descendants of Jacob out of Egypt. Over 40 years he forged them into Israel, the Jewish nation and transcribed and made Torah, the nation’s constitution. The story of the exodus is re-told at Passover every year by Jewish families and remains the most popular of all Jewish holidays among the secular and religious. However, in the Haggadah the book from which the story is retold Moses name is never mentioned. A great Rabbi taught me that the reason is each Jewish child has the same opportunity as Moses to feed directly from God’s manifestation. Therefore, the Haggadah was written to open, on this holy night a window for the participant to be enjoined in the same way and to rise to the same stature as leader of the Jewish nation. Some 400 years after Moses, King Solomon died and his son Rehavam was challenged by Yerovam for national leadership. Incredibly Yerovam led the northern tribes to a revolt and promoted two golden bull idols, their gods to compete with the temple Solomon built in Jerusalem. The idols, reminiscent of those that once elicited a similar revolt in which Moses brother in-law was killed and his brother threatened, existed north of Jerusalem. Moses grandson once served as a priest in the presence of one of these idols when the rear-guard tribe of Dan promoted their worship among the northern tribes. The political power vested in these gods was enough for Yerovam to advantage his revolution and successfully split the kingdom. In Beit El (north of Jerusalem), Yerovam built an altar and a temple for his divided nation to serve these gods and he prevented pilgrims heading south to Jerusalem. Rambam connected free choice with these characters because they epitomise the breadth of its manifestation. Jewish nationalism may orient toward righteousness, but it accommodated Yerovam and Rehavam becoming leaders of the divided nation. The tribes of Israel split, they followed different teachings, they prayed in different temples, they bordered their lands and went to war. Ever since this time, the nation Israel has never reconciled. The nation that had once been redeemed from Egypt was and remains to this very day locked in its second exiled state. A man from Yehuda (south) that came as a Prophet from Shomron (north) once froze Yerovams right arm as he revealed that his altar would be destroyed by a King from the future. That King, Yoshiyahu discovered the last surviving Torah scroll written by Moshe, it was open at the curses that foretold the impending destruction of the temple. Yoshiyahu repented deeply, he immediately defiled and destroyed Yerovam’s altar, traveled the nation destroying its idols and re-instituted Passover including the most glorious Pesach celebration in Jerusalem. Yoshiyahu’s efforts were so genuine that for the first time since Yerovam some of the northern tribes began to return to Jerusalem. Then Yoshiyahu became overwhelmed, he buried the Ark of the Covenant in a secret chamber and denied Pharaoh Neco permission to travel through Israel to attack the advancing Assyrians. Neco’s army killed Yoshiyahu piercing his body with 300 arrows. Twenty two years later the temple in Jerusalem was destroyed and the divided nation led into captivity. I believe Rambam chose Yerovam because the concepts so deeply imbued in his choice speak through these events and this prophecy to this very day. I wrote extensively about it connecting it with Yerovam’s Beit El obfuscation that he so cleverly used to divide the nation. Once this obfuscation is removed the nation will finally return to its center, ultimately from exile and eventually it will unify its views and fulfill its longstanding cultural and national commitments. That time is approaching.